You’re a small business owner with limited resources. You’ve been comfortable using manual (paper) employee management tools for years and don’t feel the need to upgrade. You may think you’re fine, but the truth is these antiquated processes may be hurting your business. Sometimes we forget that the function of human resources is to manage companies’ most important assets — employees. Instead of viewing employee management as a back-end administrative burden, why not see it as a way to strengthen your business? Having the right online solution can help you increase efficiencies and reduce costs — while giving you immediate access to the information you need. There are many drawbacks to manual or outdated HR tools. First and foremost, they’re more prone to human error, which may lead to compliance issues. For example, if you lose track of paperwork, misfile it, or use outdated forms, you may be out of compliance with critical federal and state employment laws. From a time standpoint, it just takes longer to fill out forms and generate reports. As a small business owner, you’re too busy attending to a hundred other things to be tied down with time-consuming and tedious paperwork. Outdated systems also tend to pull you away from your bigger business priorities. If you’re in business to succeed (and who isn’t? ), you can’t have draining, day-to-day tasks demanding all of your attention. You have better things to do than rifle through piles of paperwork because employees are asking about remaining PTO, swapping a shift or updating a W-4 form. It’s also important to note that paper-based systems can be costly. You have to spend money on printing, collating and filing. Safe disposal or recycling is also costly, as is shipping paper-based documents. Although using paper for HR is expensive, inefficient and time-consuming, you’d be surprised how many businesses still use it. Based on results of 295 businesses. A big disadvantage to a manual system: Paper records are susceptible to fire, flooding and other dangers. Moving employee paperwork online eliminates this risk. Now let’s focus on the positive! It’s been said that great companies are like well-oiled machines — all of the parts work together to keep it moving forward. HR is an important part of the overall machine, and it affects the momentum of your entire business. Effective, Web-based HR software tools help your business function more smoothly, which saves time and boosts your bottom line. To handle employee management as strategically as possible, you need to comply with federal and state laws, gauge issues such as turnover and hiring costs, and take care of payroll and benefits. The right HR software can automate many of these management functions and free you up to focus on more pressing matters. Further still, it reduces errors and oversights, which is great news if you want to avoid serious financial and legal complications. Out with the old, in with the new. 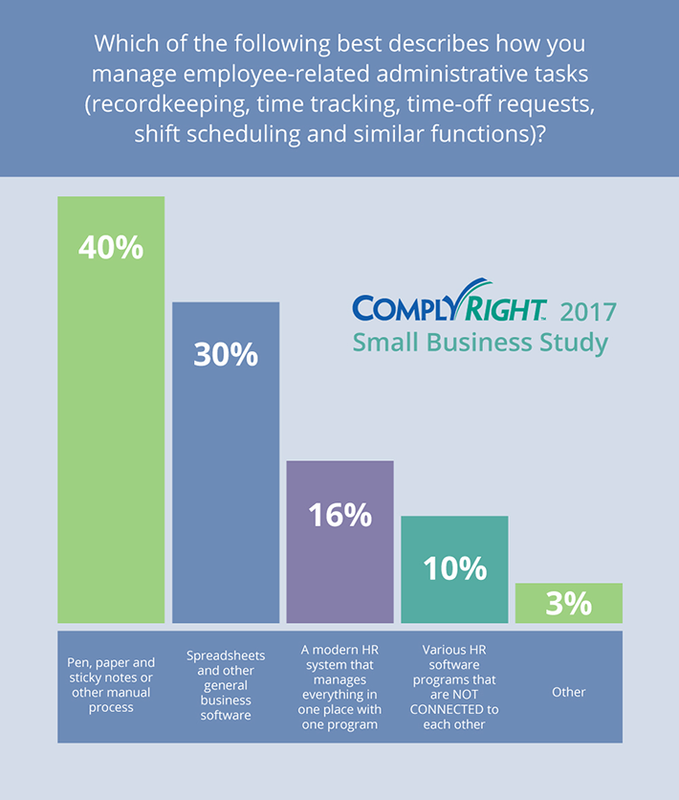 In order to keep up, keep current and remain compliant in today’s fast-paced business landscape, switching to the latest HR tools and software is one of the best investments you can make. If you’re wondering whether or not your business can benefit from electronic HR management tools, check out our HR Software Quiz. Antiquated employee management processes may be hurting your business. There are many shortcomings with manual or outdated HR tools. Outdated systems can put your business at risk of noncompliance. Handling paperwork manually can slow down productivity. The right HR software can automate your employee management functions and free you up to focus on more pressing matters.